The Beats Pill just got big. Where the original Beats Pill speaker isn't really large enough to give you the thumping bass that Beats is famous for, the Beats Pill XL is. But it's still small enough to take around with you too, like the Dr. Mario version of a ghettoblaster. For its £270 you can get better sound if you don't care too much about supercharged portability, but this is a pretty great package to lug around the house and is slightly bigger than the squarer Jawbone Big Jambox. The Beats Pill XL looks an awful lot like the smaller Beats Pill, but has been blasted with the growth ray. It's 33.8cm long and weighs 1.5kg, meaning you're not going to slip this speaker into a handbag or coat pocket. It's a mid-size wireless speaker, but still cares a good deal about being portable and convenient. About a third of the back of the Beats Pill XL is taken up by a carry handle that doesn't stick out from the cylindrical design at all, and rubber feet on the bottom mean it's ready to set down wherever there's a flat surface. This is not a hugely rugged speaker but the Beats Pill XL feels fairly well-made. Most of the front of the speaker is a speaker grille made of coated metal. It's thick and flex-free. The back of it is plastic much like the Beats headphones, but the bits that are more likely to get worn or scratched are sensibly rubbery and matt, rather than glossy plastic. Fewer things look tattier than scratched glossy plastic. We can imagine some bopping Beats fans carrying around a Beats XL with them wherever they go, but for normal people with normal social values, the design makes most sense as a mostly at-home speaker. For BBQs, poker games and just dragging from room to room, it's perfect. Thanks to the decent carry handle, larger-size wireless speakers don't get much more convenient than this, at least in design. As with most wireless speakers, the Beats Pill XL is a Bluetooth speaker with an integrated battery. There's no radio, no AirPlay and no Wi-Fi, but you do get NFC. Or so we're told. After rubbing a OnePlus One all over the thing for 10 minutes we couldn't get them to talk over NFC. It's mostly used just to pair up devices, but you can also make two Beats Pills XLs communicate to form a stereo pair. You also get an integrated microphone to let you take calls with the thing should someone ring while you're listening to music. We tried it, it works. As with most wireless speakers, the Beats Pill XL is really pretty simple. These are some of the few devices today that don't try and do virtually everything. There are some nice design touches, though. The light-up Beats logo on the front isn't just for show, it's a button. Press it and the Beats Pill XL will try to connect to whatever it was last paired to, and the button also works as a remote control during playback. Much like a headphone remote control, you can use it to play/pause music or skip tracks. Using an Android phone, we could only get it to skip forward, not back, but that's not bad going when it was primarily designed for iOS devices. Volume can be controlled using your phone/tablet, but there's a whole extra row of controls around the back too. One one side you get rubber buttons for power and volume, all sealed to avoid letting any gunk in. Right by them is a little 5-dot LED display that tells you the battery level following a quick tap on the power button. On the other there's a rubber flap keeping the extra connections safe from gunk. Only one is left exposed, the power cable. Unfortunately it's not a microUSB socket but a cylindrical one, and there's a separate power brick you need to use to charge the Beats XL. It loses the speaker a few convenience points. A fair bit of thought has gone into the design of the Beats Pill XL, and we see that in the speakers used under the hood too. Where the small Beats Pill uses piddly little 1-inch drivers and a bass radiator, the Pill XL has a much more convincing setup. Behind the grille are two 3-inch mid-range drivers, two 1.25-inch tweeters and – around the back – a 3x3-inch bass radiator. So the drivers that supply the treble in the Pill XL are larger than the drivers running the whole show in the standard Pill speaker. It's a huge sonic improvement over the original Pill. The sound is beefy, it goes loud and thanks to angling of the almost-side-mounted tweeters, the Pill XL disperses sound quite widely. In the last year we've seen Beats really up its game in terms of hardware design, and the Beats Pill XL is another example of this. It's pretty good. Those fearing a murky bassy mess should relax too. Sound balance is reasonable, which is a compliment for a Beats product. There is a slight overemphasis on the bass, but it's matched with decent treble thanks to those dedicated tweeters. This still is not an audiophile's dream, though. The sound is a case of bass + treble, with the mid-range locked in the backroom like a timid substitute geography teacher at the annual staff party. The weak-mid-range means that vocals are often dominated by the bass a bit. The low-end isn't truly taut and sophisticated either, because it relies on a bass radiator rather than a proper active driver. Radiators are great at producing bass weight when there's virtually no space to work with, but not so good at bass fidelity. Fundamentally, though, it's a very well-engineered radiator system. Where some speakers start producing flatulent distortion when the volume is upped too high, the Beats Pill XL can go loud with confidence. One of the few good small wireless speakers that uses an honest-to-god real bass driver is the Loewe Speaker2Go. It offers greater fidelity than the Beats Pill XL, but then the Pill has greater scale and wider dispersal. You do need to check how you manage the volume, though. The rear volume controls and your phone's controls function independently, and if you max out the Pill XL's amp while keeping your source volume low, you'll hear an unsightly treble hiss when listening to quiet-ish music. The Beats Pill XL also performs pretty well on stamina. It has a 4400mAh battery that Beats rates for 15 hours of use between charges. It's long enough to make it tricky to test without pulling an all-nighter with your wireless speaker. However, Beats seems to be on the money. We listened to it for several hours each day during a week and found there was still charge left at the end. Most of you should be able to go a good couple of weeks without charging. The mechanics of charging the Beats Pill XL could be improved, though. microUSB charging or a charge dock would make the speaker all the more convenient. 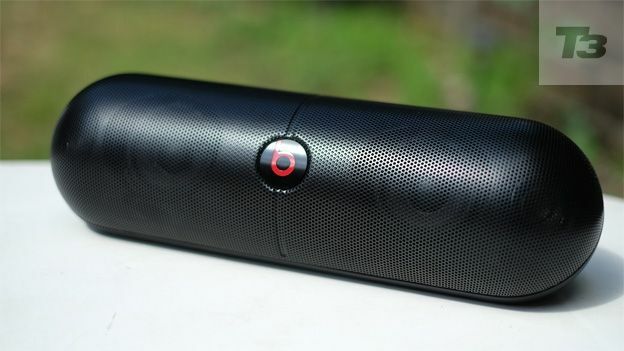 The Beats Pill XL: bigger, better, louder. It's much better than the smaller Beats Pill, both in terms of sound quality and bang for your buck. There's still some of that usual Beats bass prominence and there are higher-fidelity options out there. But this is a good wireless speaker, make no mistake.